This picturesque family home is the product of an extensive renovation which updated several aspects of the original 1935 Greek revival cottage. 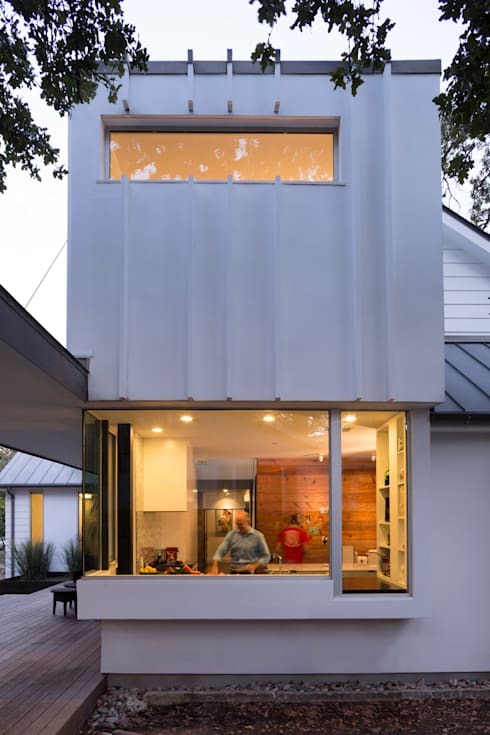 This home was designed to honor the past without being overly reverential, adding practical additions for a busy and creative family life. From the classic, symmetrical design to the neatly trimmed yard to the friendly white porch, this family home is as close as it gets to a physical manifestation of the American dream . There's nothing more welcoming than this vision of a cheerful family – with pets! – all together on their sunny front porch! 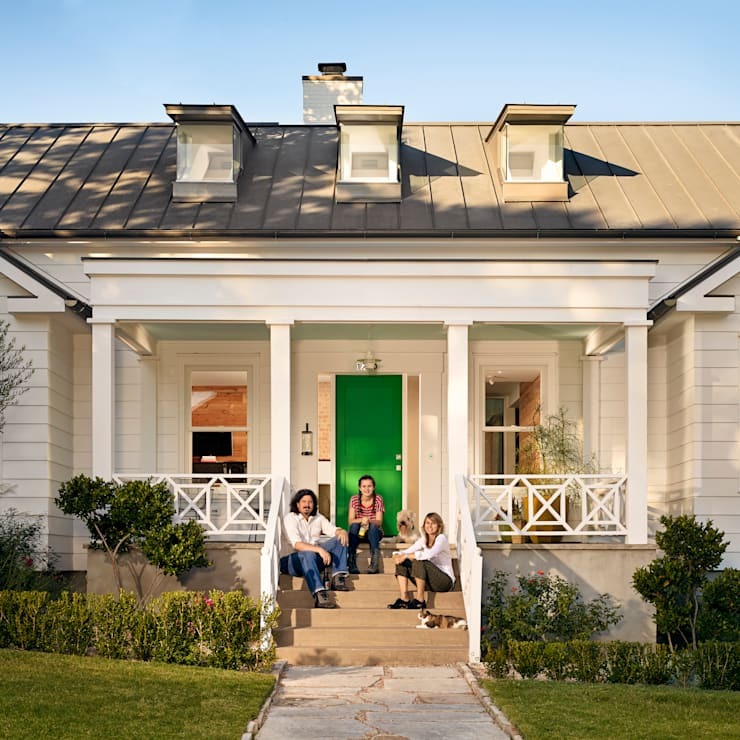 This Greek revival home clearly shows the typical porch columns and white colour scheme, with modern updates like the vibrant green door. Hiding in this classic image of family life is a hefty renovation in which the architects raised the original roof four inches from its previous height. The interior section of the entrance is highly practical and streamlined, with a large space for taking off coats and shoes, followed by double swinging doors that are easy to open with arms full of groceries. Guests are first welcomed through friendly window panes in both sets of doors, and then by the warmth of the natural wooden interior walls. This artistic space is balanced and concise, filled with texture and colour but in no way overwhelming to the senses. A backdrop of brilliant white creates an art gallery feel, showcasing each piece of furniture as its own unique work of art. The pieces in this cheerful room range from majestic antiques to sleek contemporary features, which creates a high-energy mix punctuated by crisp shapes and bright colours. The kitchen pulls away from eclectic antiques, embracing a much more modern aesthetic. 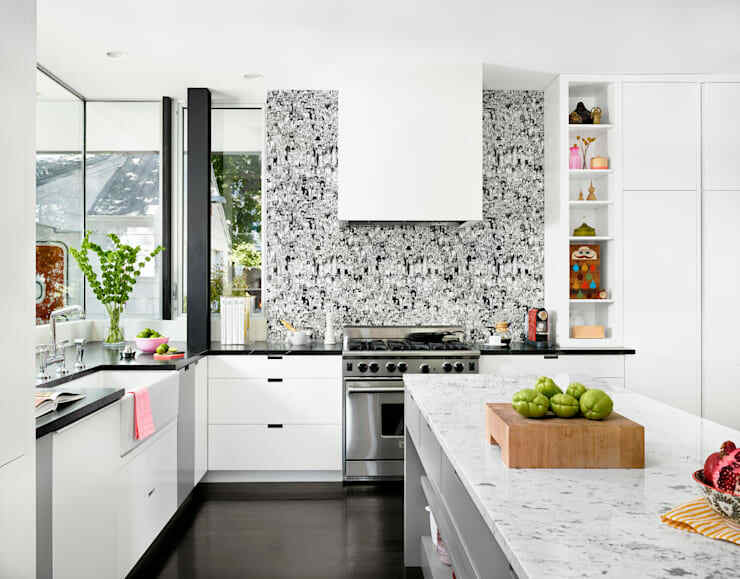 Notable in this room is the stove hood, which has been covered in a dazzlingly white shell to match the white cabinets. With ample sunlight coming in through an interior wall (and corner) of windows, this white kitchen has an ultra-clean feel. This image offers a lovely view of the kitchen, as seen through the exceptionally wide windows that cover an entire wall and a half of the kitchen space. This bedroom exudes a strong preference for both even balance and high energy. 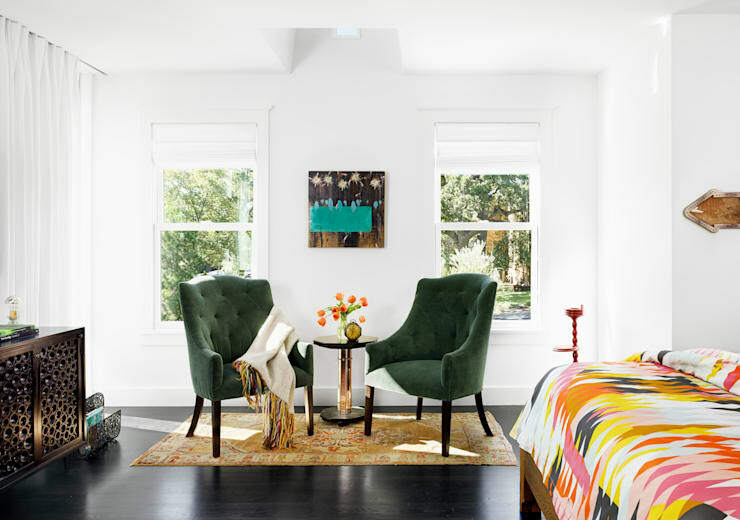 The symmetrical shape of the room is emphasized by the symmetrical placement of two identical chairs in front of the twin windows, with larger furniture balancing out the other extremes of the room. Similar to the dining room, this decor scheme encompasses a range of styles and eras, all made to shine against a starkly contrasting canvas of white and black. Another symbol of modernity in this renovated home, the stairs leap from utilitarian to artistic with this unique design! 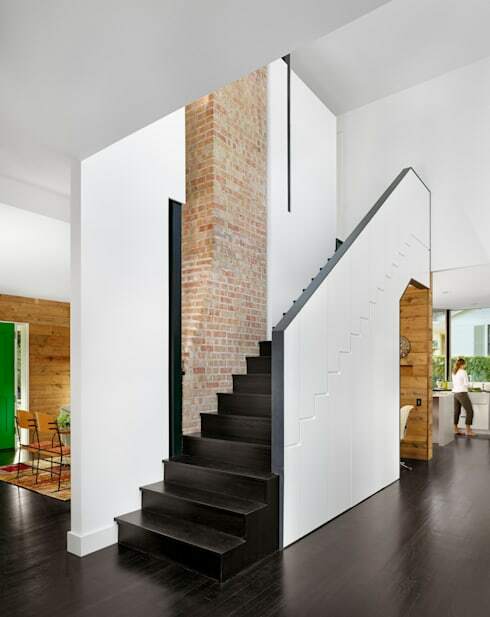 Set against the brick chimney – an element preserved from the original house – these black and white stairs look ever the more eye-catching, and the artistic textured wall with stair design adds another layer of interest. The stairs house storage cabinets, with an office set in the taller section at the end. 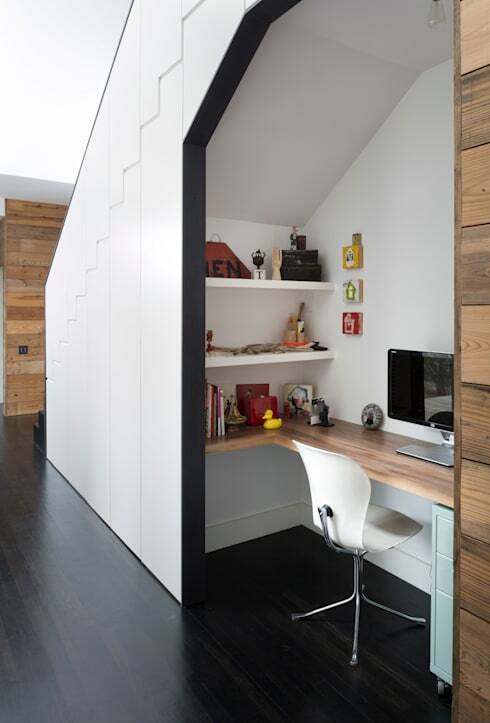 This clever design creates a quiet workspace that stays out of the daily shuffle while still remaining accessible and sociable. What's your take on this modern family home? Comment on this contemporary design below!